DNA-tethered nanorods link up like rungs on a ribbonlike ladder—a new mechanism for linear self-assembly that may be unique to the nanoscale. Scientists at the U.S. Department of Energy's Brookhaven National Laboratory have discovered that DNA "linker" strands coax nano-sized rods to line up in a way unlike any other spontaneous arrangement of rod-shaped objects. The arrangement-with the rods forming "rungs" on ladder-like ribbons linked by multiple DNA strands-results from the collective interactions of the flexible DNA tethers and may be unique to the nanoscale. The research, described in a paper published online in ACS Nano, a journal of the American Chemical Society, could result in the fabrication of new nanostructured materials with desired properties. "This is a completely new mechanism of self-assembly that does not have direct analogs in the realm of molecular or microscale systems," said Brookhaven physicist Oleg Gang, lead author on the paper, who conducted the bulk of the research at the Lab's Center for Functional Nanomaterials (CFN, www.bnl.gov/cfn/). Broad classes of rod-like objects, ranging from molecules to viruses, often exhibit typical liquid-crystal-like behavior, where the rods align with a directional dependence, sometimes with the aligned crystals forming two-dimensional planes over a given area. Rod shaped objects with strong directionality and attractive forces between their ends-resulting, for example, from polarized charge distribution-may also sometimes line up end-to-end forming linear one-dimensional chains. Neither typical arrangement is found in the DNA-tethered nanorods. "Our discovery shows that a qualitatively new regime emerges for nanoscale objects decorated with flexible molecular tethers of comparable sizes-a one-dimensional ladder-like linear arrangement that appears in the absence of end-to-end affinity among the rods," Gang said. Alexei Tkachenko, the CFN scientist who developed the theory to explain the exceptional arrangement, elaborated: "Remarkably, the system has all three dimensions to live in, yet it chooses to form the linear, almost one-dimensional ribbons. It can be compared to how extra dimensions that are hypothesized by high-energy physicists become 'hidden,' so that we find ourselves in a 3-D world." "Once a nanorod connects to another one side-by-side, it loses the cylindrical symmetry it had when it had free tethers all around. Then, the next nanorod will preferentially bind to another side of the first, where there are still DNA linkers available." Using synthetic DNA as a form of molecular glue to guide nanoparticle assembly has been a central approach of Gang's research at the CFN. His previous work has shown that strands of this molecule-better known for carrying the genetic code of living things-can pull nanoparticles together when strands bearing complementary sequences of nucleotide bases (known by the letters A, T, G, and C) are used as tethers, or inhibit binding when unmatched strands are used. Carefully controlling those attractive and inhibitory forces can lead to fine-tuned nanoscale engineering. 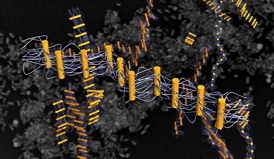 In the current study, the scientists used gold nanorods and single strands of DNA to explore arrangements made with complementary tethers attached to adjacent rods. They also examined the effects of using linker strands of varying lengths to serve as the tethering glue. After mixing the various combinations, they studied the resulting arrangements using ultraviolet-visible spectroscopy at the CFN, and also with small-angle x-ray scattering at Brookhaven's National Synchrotron Light Source (NSLS, www.bnl.gov/ps/nsls/about-NSLS.asp). They also used techniques to "freeze" the action at various points during assembly and observed those static phases using scanning electron microscopy to get a better understanding of how the process progressed over time. The various analysis methods confirmed the side-by-side arrangement of the nanorods arrayed like rungs on a ladder-like ribbon during the early stages of assembly, followed later by stacking of the ribbons and finally larger-scale three-dimensional aggregation due to the formation of DNA bridges between the ribbons. This staged assembly process, called hierarchical, is reminiscent of self-assembly in many biological systems (for example, the linking of amino acids into chains followed by the subsequent folding of these chains to form functional proteins). The stepwise nature of the assembly suggested to the team that the process could be stopped at the intermediate stages. Using "blocker" strands of DNA to bind up the remaining free tethers on the linear ribbon-like structures, they demonstrated their ability to prevent the later-stage interactions that form aggregate structures. "Stopping the assembly process at the ladder-like ribbon stage could potentially be applied for the fabrication of linear structures with engineered properties," Gang said. "For example by controlling plasmonic or fluorescent properties-the materials' responses to light-we might be able to make nanoscale light concentrators or light guides, and be able to switch them on demand." Additional authors on this study include: Stephanie Vial of CFN and the International Iberian Nanotechnology Laboratory in Braga, Portugal, and Dmytro Nykypanchuk, and Kevin Yager, all of CFN. This research was funded by the DOE Office of Science (BES), which also provides operations support for the CFN and NSLS at Brookhaven Lab. The Center for Functional Nanomaterials is one of the five DOE Nanoscale Science Research Centers, premier national user facilities for interdisciplinary research at the nanoscale supported by the U.S. Department of Energy, Office of Science. Together the NSRCs comprise a suite of complementary facilities that provide researchers with state-of-the-art capabilities to fabricate, process, characterize and model nanoscale materials, and constitute the largest infrastructure investment of the National Nanotechnology Initiative. The NSRCs are located at DOE's Argonne, Brookhaven, Lawrence Berkeley, Oak Ridge, Sandia and Los Alamos National Laboratories. More information about the DOE NSRCs: science.energy.gov/bes/suf/user-facilities/nanoscale-science-research-centers. One of the world's most widely used scientific research facilities, the National Synchrotron Light Source (NSLS) is host each year to 2,400 researchers from more than 400 universities, laboratories, and companies. Research conducted at the NSLS has yielded advances in biology, physics, chemistry, geophysics, medicine, and materials science. More information about NSLS: www.bnl.gov/ps/nsls/About-NSLS.asp.